We are a leading Manufacturer of vacuum fried mixed chips from Pune, India. 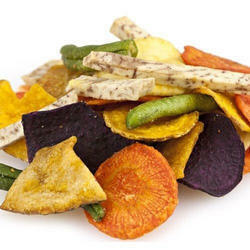 Our mouth-watering Vacuum Fried Mixed Chips are a must on every food lover's dining table. Hygienically prepared in clean and pest free factories, these food items use the purest ingredients such as farm fresh fruits and vegetables and fried in quality ghee and oil. Attractive packaging and price are outside qualities that further popularize our offerings.